I once thought that white truffles were merely stronger-tasting versions of the black, but their flavors and aromas are distinctly different. The earthy, musky scent of the black truffle is much more subtle, while that of the white truffle is extremely heady, garlicky and can be overpowering. 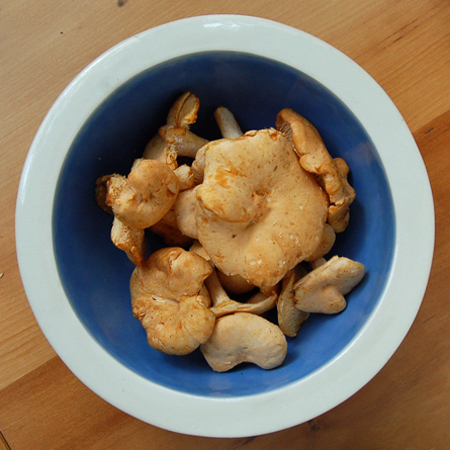 White truffle detractors liken the aroma to that of a teenage boy's gym sneaker. I personally think they are just bitter because they can't afford them. The white Alba truffle from Italy - tuber magnatum pico - can run upwards of $220 an ounce! Oregon is producing very good-quality white truffles at a fraction of the price - but they aren't quite the same. I have to admit that I didn't buy any white truffles for this post. Not even the Oregon variety was available. And it isn't something I generally stock... Who does? The famous gastronome (Can we use "foodie" here? Probably not...) Brillat-Savarin probably had them around whenever they were available. The "diamond of the kitchen" was his moniker for them. And a word about finishing. 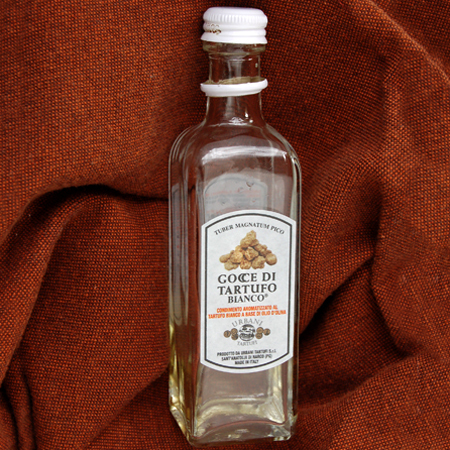 White truffle oil is a finishing oil, and it is probably the most obvious of them. When one cooks with flavored oils or even extra virgin olive oil, the strength in the taste cooks out rapidly when sautéing, stewing, braising or roasting. Many chefs will tell you to save the good stuff for last, and they are absolutely right. I admit to using extra virgin olive oil for everything, though, because the cupboard is too small for multiple gallons of the stuff. But the truffle oil? Never cook with it. Just before you take the plates to the table, drizzle a small amount - just a half teaspoon or so - and the entire dish will be well-flavored. Some important things to keep in mind. The bread used is crucial. Pain de mie is a very specific bread with a fine, caky crumb. It is very hard to find, I admit, but there are other options - homemade white bread, firm bakery white bread (unsliced), and I have even had some luck with "English Muffin Bread," also unsliced. If the crumb is wrong, the boxes will be hard to cut. Although I show a knife in these photos, it is completely unnecessary - the boxes cut easily with just a fork. As to the taste, the most important thing to keep in mind is your taste. You might not like white truffles. You may prefer black truffles. You might not like mushrooms. 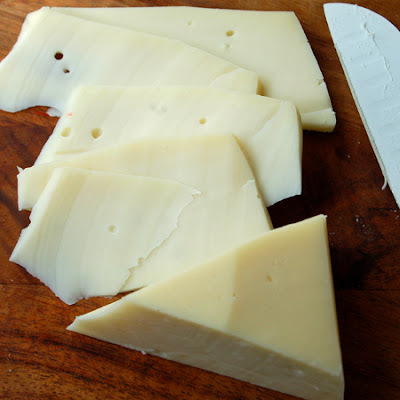 You might not be able to find Fontina cheese. You may be allergic to eggs. Think of this recipe as a starting point to make your own version. I love it just this way but Mark, a white truffle detractor if there ever was one, uses extra virgin olive oil or lemon olive oil on his. The asparagus was great... especially good with the lemon olive oil. Other vegetables and cheeses would be good, as well. Different semi-hard cheeses work, too - thy just need to melt well in the oven. It would even be fine without the egg if that isn't to your liking. So, here is my version - with sautéed chanterelle mushrooms, fresh marjoram from the garden (which is amazing with mushrooms!) and a light drizzle of white gold... Oh, and if you happen to have a white truffle stored somewhere, a few slices on top would be ever so lovely. 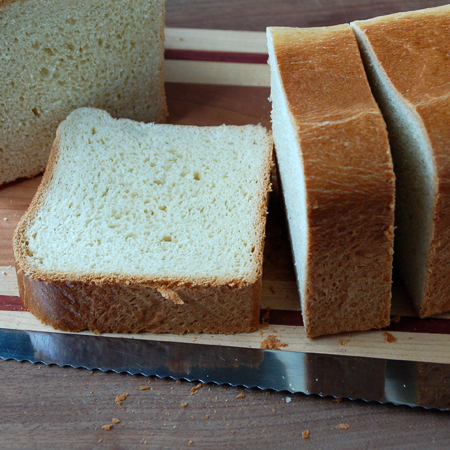 After trimming bread of its crusts, use a knife to cut a 1 1/4-inch hole in the bread that goes halfway through. Scoop out the "hole" and eat as a snack while continuing. This should leave a nice "cup"in which to nestle the egg yolk. Toast the bread boxes directly on the oven rack for 5 minutes, or until nicely toasted. 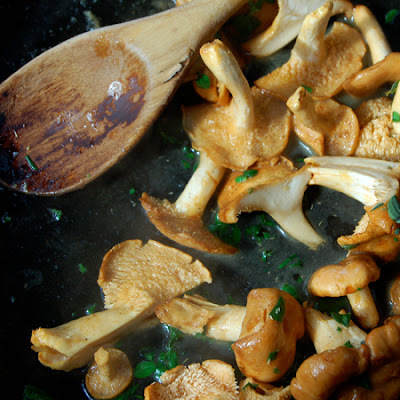 While bread is toasting, prepare mushrooms. Place the butter in a skillet and melt; add mushrooms and sauté over medium heat until done- about 6 minutes. Add marjoram, season with salt and pepper, and sauté 1 minute longer to meld the flavors. When bread boxes are toasted (note: the sugar content of pain de mie is high and it browns quickly), remove them and allow to cool a minute or so. Carefully place an egg yolk in each cup, trying your best not to break it. Cover each bread box and egg yolk with two slices of cheese, overlapping slightly. Place on a a greased cookie sheet and bake 5 minutes, or until cheese is beginning to brown an dis bubbly. 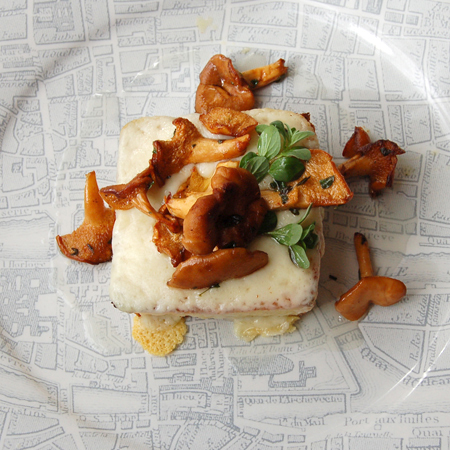 To serve, place one box on each of two plates and top with mushrooms. Drizzle with truffle oil and serve immediately. I've never eaten white nor black truffle, even though in Greece you can find lots of them, especially up North. 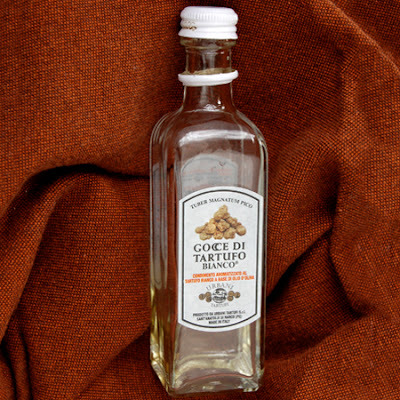 I've only used white truffle oil and that in a couple of dishes. I can't say I was enamored with it (perhaps it was the synthetic stuff?) but I'm willing to give it another try. If I find a decent one that is. 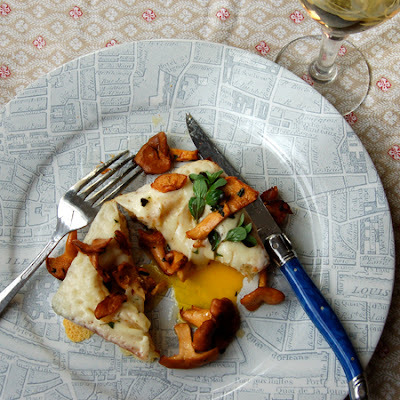 Your dish looks delish David, I'll take toasted bread, chanterelles and eggs anytime! I really enjoy your stories, David. Too bad I don't actually make the recipes! I'm a philistine, I know. And Lea, you aren't a philistine - you just have too many other mouths to feed!